The art of using mixtures of chemicals to produce explosives is an ancient one to say the least. Black powder - a mixture of potassium nitrate, charcoal, and sulfur - was being used in China well before 1000 AD and is also used in military explosives, construction blasting and, of course, fireworks. Years and years ago fireworks just used to be basically rockets and loud bangs and the colours such as orange and yellow came from charcoal and iron fillings. 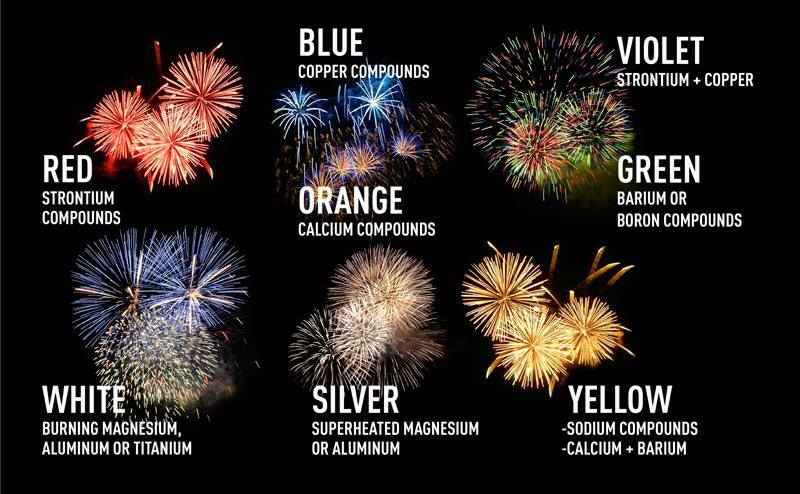 However, great advances in chemistry in the 19th century had new compounds finding their way into fireworks. Salts of copper, strontium, and barium added some brilliant colours. Magnesium and aluminum metals gave a dazzling white light.